LoveToKnow was thrilled over the idea of a vintage handbag interview with collector and aficionado Michele Howard. Michele very generously shared information about her collection, what to look for in vintage handbags and some lovely photographs from her own collection. LoveToKnow (LTK): Michele, thank you for taking the time to talk to us about your vintage handbag collection. Tell us a little about your childhood. Did you love to play dress up and carry purses from a young age? Michele Howard (MH): No, I was a tom boy and played with trucks and built tree houses until I became a teenager. Then my fascination with beautiful purses began from watching the Hollywood stars carrying lovely handbags in movies and seeing the advertisements in fashion magazines. I grew up in a rural area in northern California and fashion then was only for the glamorous ladies such as Grace Kelly and Audrey Hepburn. LTK: When did you first grow interested in vintage handbags, as opposed to other handbags? MH: It was always there but once I started my working career after our two children started school I shopped at consignment shops to save money. I saw these unique and well designed handbags sitting on the shelves gathering dust. There was no interest from customers other than myself to purchase them. 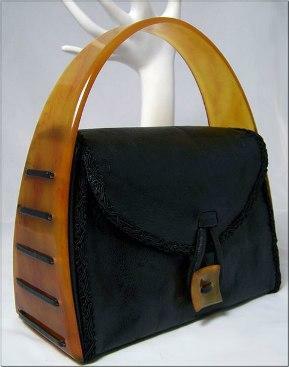 I started to collect vintage handbags in the early 70's. Such names as Koret, Lewis, Rosenfeld, Rialto to name a few. LTK: How many handbags do you have in your collection? MH: I have sold most of my collection through my web site business "Vintage in Style". I would say at this point in time I have about 150 left from my collection, mainly Patricia Smith Moon Bags. I do not want to be known as Imelda Marcos of vintage handbags, so I will never divulge how many I once owned. LTK: Which is your absolute favorite handbag in your collection? MH: My favorite vintage handbag is the Corde' handbags from the 40's. I once watched Joan Crawford carrying one in a movie years ago and thought the clutch was so stunning. The bag was so long and was trimmed with Lucite. LTK: Have you pulled any of your family and friends into looking for these handbags for you? MH: No but I do get phones calls from friends and my daughter stating they spotted a vintage handbag they think I might like along with the description. LTK: Where do you find your vintage handbags? MH: I shop estate sales, consignment shops, auction sites. I also work with several estate buyers that are located throughout the USA. I am very fussy and I look for specific designers and conditions. I also look for very UNIQUE handbags that are not quite vintage. The estate buyers are aware of my likes and dislikes. LTK: What advice would you give to someone who was interested in collecting vintage handbags? MH: Most of my customers have a certain designer or shape, such as 50's and 60's box purses they like the most. Until you get to know the quality vintage designers well, rely on someone of experience to purchase from. Certain vintage purse designers such as Koret used quality material and his handbags have traveled through time very well. Never buy a vintage bag that has thin dust like particles inside or outside the bag. This means the glue or lining they used has deteriorated. If Lucite purses have a vinegar smell, the Lucite is breaking down. Be very careful of buying vintage alligator. Look for signs of a repeat pattern which means the bag is embossed and not real skin. Also check the handle and sides. This is where the skin starts splitting from age and use. LTK: What is one thing shoppers should look out for that would indicate that a handbag was a fake or not of good quality? MH: The designers that are still in business today such as Chanel, Louis Vuitton, Gucci to name a few I really do not deal in. If in doubt always only buy from a reputable vintage site or store. Most of the designer handbags I carry were bought up by these big name designers. Meyers was bought by Coach, Rosenfeld by LV and on and on. LTK: Where do you plan to take your collection next? Planning to add any new items, like coin purses? MH: I already carry coin purses and wallets. I just started selling my vast collection of Patricia Smith Moon bags two months ago. Moon Bags are very unique and were produced in the 70's and 80's. LTK: Anything you'd like to add? 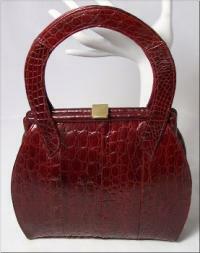 MH: Like my web site states "Vintage handbags represent variety, personality and individuality. Add your own distinctive flare to your unique style". A very warm thank you to Michele Howard for her insightful thoughts on vintage handbags and what to look for when on your own vintage handbag hunts. You can see some of Michelle's unique collection at her website Vintage in Style.